Students at West Nottinghamshire College have been talking politics with a member of the House of Lords. 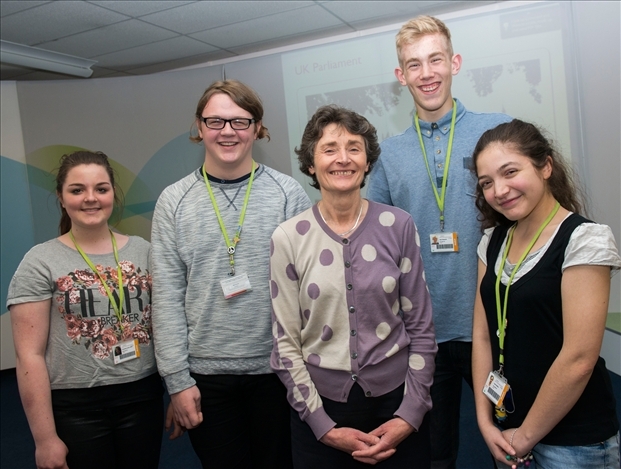 The college hosted a visit by former education secretary and Labour life peer Baroness Morris of Yardley on Friday (9 May 2014) to inspire students to learn more about, and engage with, the political and parliamentary process. Baroness Morris spoke to a group of 40 students about her career in politics and the work and role of the House of Lords before taking part in a question and answer session. The students are on courses ranging from A Level law, BTEC public services and the Foundation Degree in criminology and law, with most aged 16 to 19. The visit to the Derby Road campus was arranged through the Lord Speaker’s ‘Peers in Schools’ programme. This continuing outreach programme, which has been running across the UK since 2007, sends members of the House of Lords into schools and colleges across the country to give talks in support of the citizenship curriculum. Mary Buckland, head of academic studies, public services and sport, said: “This was a fantastic opportunity for students to interact with someone who knows the parliamentary system inside out, as it can sometimes seem far removed from their daily lives. Baroness Morris said: “It is really important to engage young people in politics and democracy, never more so than now, when the number of people showing an interest in politics is diminishing. They are citizens and they are our future so anything that increases their knowledge will help; politicians just need to re-connect the political process. Baroness Morris began by her visit by speaking to students in Create, the college’s £5 million centre for creative industries and digital technologies, and seeing trainee hairstylists, beauticians, holistic therapists, chefs and hospitality professionals learning their trades in its £11 million Lifestyle Academy, which boasts salons, a spa and fine-dining restaurant. A life peer in the House of Lords since June 2005, Baroness Morris previously served as education secretary and as minister for arts in the former Labour government.